All things to all men. All things to all men. Don’t forget, we’re also here for the guys! Because a man’s skin needs just as much care. Men’s skin is generally thicker and oilier, and good skin care is by no means a luxury when it comes to looking and feeling fresh and well-groomed for the day to come. 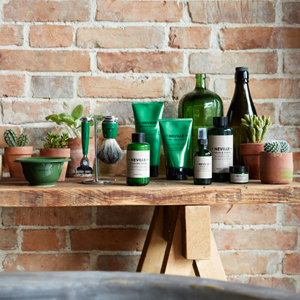 In addition to the wide range of unisex care products, we also offer a full range of specific men’s grooming products from brands such as Baxter of California, Neville, Bullocks, John Masters Organics, and Korres. (Malin+Goetz) Resurfacing Glycolic Pads - 50 st.
Supercharge the morning grooming ritual with Neville, a new natural line of hair care, body care, skin care and shaving products for the discerning gentleman. With quality at the heart, Neville is loaded with natural ingredients that work hard to deliver results. Think of Neville as a self-defence system against life’s natural aggressors - grime, pollution, weather and stress – all known to wreak havoc with skin and hair.